The research scholars ofIndian Institute of Technology (IIT) Guwahati, continued their protests for the fourth day on Monday, demanding hike in fellowship. The Government of India had earlier stated the fellowships for research scholars would be increased periodically (every four years). As per assurance, it was supposed to be increased by April, 2018. But after 8 months of the assurance, the research scholars are yet to get justice. 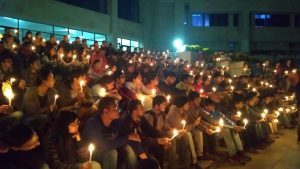 The scholars ofIIT Guwahatiorganized a candle march from Central library to the Admin building from 5:00 pm to 7:00 pm on Monday, at the campus. There was a good participation at the candle march and resentment was visible. The undergraduate students also extended their support in the candle march. The march started from the Lakshminath Bezbaroa Library at 5:00 pm IST. The support of the few faculties of the institute in protest further backed the enthusiasm of the students. The students and faculties wearing institute hoodies, a black ribbon on the head, and candle in their hand, marched from library to the administration building. All the centrally funded research institutes (CFTIs) earlier conducted a signature campaign in the month of November 2018. The signatures with a cover letter was either forwarded by the head of institute or the student bodies forwarded the letter directly to MHRD. The representative of researchers at New Delhi stated “it is hard to believe the working of MHRD and attitude towards the nurturing scientist of the nation”. A national level meeting was conducted on January 20 with student representatives of all IITs/IISc concluded that they would continue to protest using social media, postcard campaigns. Also, planning of a relay hunger strike by all the IITs/IISc starting from a fixed date is under process. The administration of all the IITs, NITs and research labs are under pressure; it was made very clear that if all the scholars started to boycott their duties, and come out on roads to demand rather than silently working in lab, it won’t be possible to run a single class.